In the summer of 2014 I started watching America's Favorite Quiz Show regularly again, as the reruns of the Battle of the Decades were airing. This led to a lot of new websites discovered and a lot of Tweeting over the course of Season 31. I've started to compile some data about the show; this page serves as a repository for those pages, as well as important links. A comprehensive list of every station airing the show. Side-by-side comparison of Seasons 33 and 34. 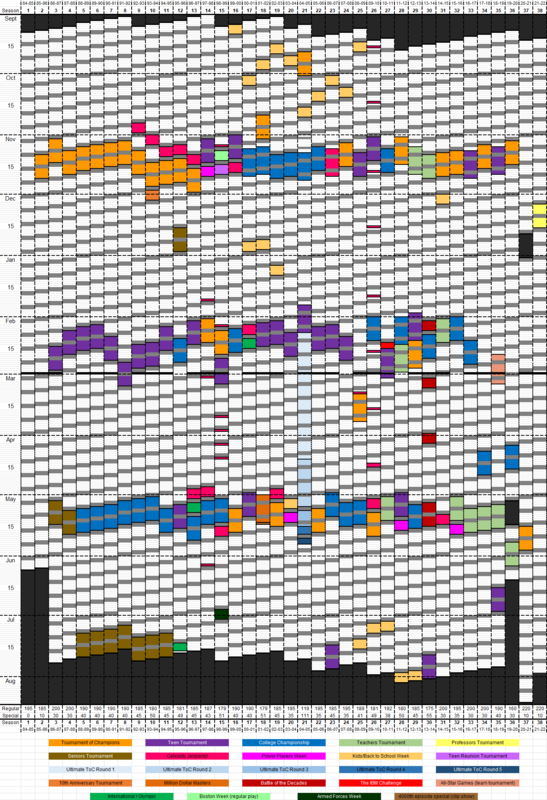 Year-by-year Tournament of Champions data. A comparison of performance in regular play versus the Tournament of Champions. 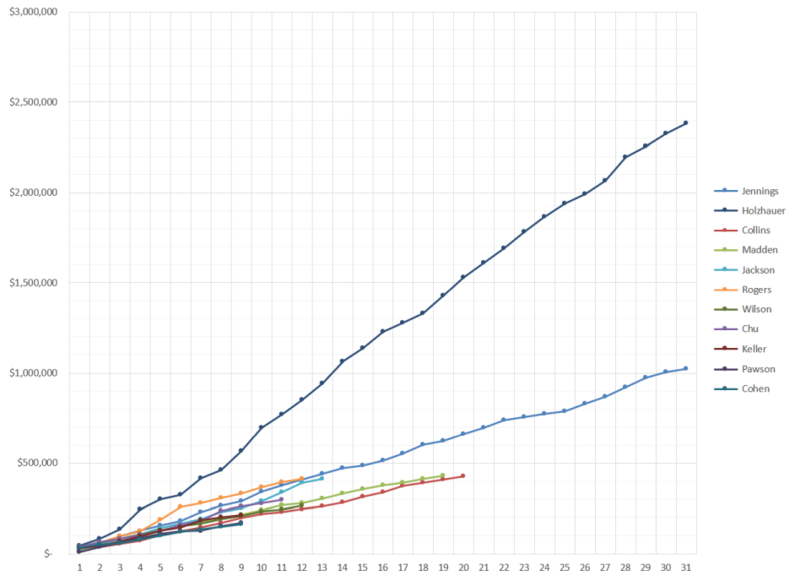 Players' performance in reunion tournaments. The lineage of Jeopardy! champions, 2003-2016 (rendered extinct by the triple loss on January 18, 2016). The "Master Jeopardy! 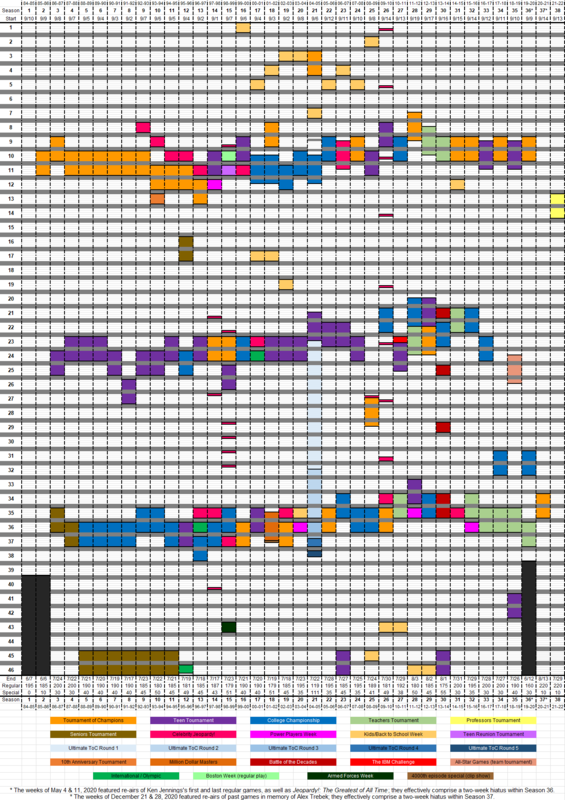 Calendar": color-coded charts showing every special-play event in the show's history: indexed by calendar date or by air week. My Coryat scores: This season (35) | Last season (34) | 2016-17 (33) | 2015-16 (32). J! Archive, a fan-created database of games, clues, and players. JBoard.tv, the message board for show fans - including many, many former contestants. r/Jeopardy, where the show's fans congregate on Reddit. The Final Wager. a now dormant site primarily about wagering by Keith Williams, the 2003 College Champion. The Jeopardy! Fan - daily recaps, historical features, and player and fan interviews. An archive of Complete the List, TJ!F's podcast game show.